One of the best things about the Summer Hoops Festival this past week was that the organizers brought in some top-flight teams from outside of the Sunshine State. The ability to bring in teams from the various shoe-sponsored leagues to compete against each other is a real attraction for college coaches and fans. Here’s a look at just a small sampling of the talent that impressed. Before we begin, we want to congratulate Team Loaded NC for winning the AAU 17U Nationals in the same week that they participated in the Summer Hoops Festival. In the title game, the Adidas Gauntlet Gold participant sent Kentucky-based M.A.T.T.S Mustangs to the glue factory by a whopping 42 points! This is the second year in a row that the champion at the 17U Nationals also participated in the Summer Hoops Festival. One of the more highly regarded players for Team Loaded NC is 6’7 wing Jaelyn Withers out of North Mecklenburg, NC. A bouncy and active wing, Withers excelled at getting to the basket and finishing. He also was quite active in rebounding the basketball at both ends of the court. Justin McCoy, a 6’8 forward from Panther Creek, was a key factor inside for Loaded NC. He scored well around the basket as well as out to the high post and short corner areas. While not the gifted athlete that teammate Withers is, McCoy is good enough and pretty much dominates his rebounding area. James Franklin, Jr., a 6’5 guard from Siegal, had some exciting, high-flying plays that got teammates off the bench in jubilation. In a game we watched, he missed the only perimeter shot he took, but Franklin spent a lot of time at the free throw line as defenders simply could not keep him out of the paint. One of the better programs in the Under Armor Association, the Atlanta Xpress is not just about Class of 2020 top ten standout Anthony Edwards, a player we spot-lighted earlier in the week. Tyson Jackson, a 6’9 forward out of Creekside, was the perfect inside complement to Edwards’ perimeter brilliance. On day one, he did a fine job of battling highly-regarded C.J. Walker, tallying 13 points and 8 rebounds in a big win. In two games the following day, Jackson continued his stellar play in the paint by scoring near the basket, challenging shots in the paint and gathering rebounds at both ends. He spent a lot of time at the foul line thanks to his ability to out-work opponents on the offensive glass. On the perimeter, both Lance Terry, a 6’2 guard out of The Heritage School and 6’3 combo Chase Hunter from Westlake, made an impact. There were times that it seemed like Terry couldn’t miss from beyond the arc. A solid ball-handler and passer, Terry spent some time running the point and looked comfortable doing so. He drove the ball and scored in the lane just enough to make opponents think twice about over-playing him for the outside shot. Hunter scored well from all three levels during his time at the Hoops Festival. He creates and makes his own shot regardless of the defense and those shots fall with a high success rate. Hunter is solid in the other fundamentals of the game as well, but his ability to “get buckets” puts him at another level. Based out of Texas, this EYBL team came East and performed quite well. We mentioned 6’3 guard Justin Webster earlier in the week and he had some help as well. Tylan Pope, a 6’6 forward from Franklinton, was a potent force around the basket in a tough game against Team Breakdown. He hustled his way to several inside baskets and offensive rebounds. Pope ran the court swiftly for scores in transition and had no difficulty finishing over the rim. It was Pope that converted a three-point play with just over thirty seconds left to break a tie game against Team Breakdown, ultimately winning by those three points. Also making his presence felt for Pro Skills was 6’6 wing Jordan Wright from the Dunham School. He stuffed the stat sheet in a variety of ways in the team’s win over the Florida Sons: rebounds at both ends, drives to the rim, floaters in the lane and jumpers from both inside and outside the arc. A mainstay in Nike’s EYBL, the Lightning have been a frequent participant in the Summer Hoops Festival. We only got to see one game from Posh Alexander, considered one of the top guards in the 2020 Class. He went down with an ankle injury early in his second game. In game one, while he struggled with his outside shot, his quickness and speed with the ball, passing instincts, and tenacity on defense really stood out. The scant silver lining to his injury was that some other players got the chance to stand out. One of those was 6’2 guard Dashawn Davis from Our Savior Lutheran. 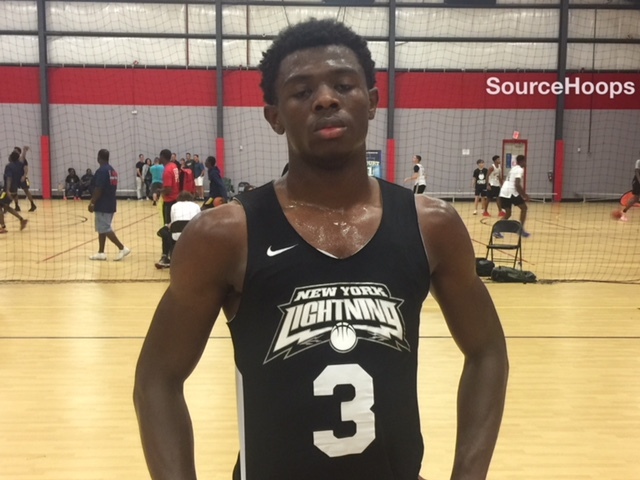 A quintessential “NYC” guard, he handles the ball well under pressure, finishes with flare at the basket, and gets after the ball on defense. Davis has good form on his jumper but it just wasn’t falling this past week. That wasn’t a problem for 6’3 Jordan Dingle out of Blair Academy. Once he got familiar with the shooting background, he was dialed in from deep, knocking shots down off the bounce as well as off the catch. He’s also physically strong with the ball and scores at the basket while absorbing contact. Fredelin Castro, a 6’8 forward out of Redemption Academy was a solid interior complement to the Lightning’s perimeter group. He was tough on the glass at both ends and ran the floor for scores. Castro showed a nice touch around the basket and got his shot up and down quickly when receiving drop offs from the guards after breaking down the defense with the dribble. An Adidas Gauntlet Gold program, Team Loaded brought an impressive array of underclass talent to the Summer Hoops Festival. We spot-lighted Henry Coleman III from the 2020 Class earlier in the event. However, he’s got a couple of classmates that have a bright future as well. Earl Timberlake, a 6’6 guard from famed DeMatha Catholic, was solid in his play. The lefty spent a lot of time initiating offense, and could play some point at the collegiate level. While he didn’t take many shots from the perimeter, those he did take went down a good percentage of the time. Timberlake was most effective driving to the basket as he made good shot vs. pass decisions on the move. He did a fine job of finding openings in the defense in which to score once he got to the basket. Defensively, he’s active and uses his reach and quick feet to cause havoc on that end of the court. Another defensive gem for the team is 7’0 center Mark Williams from Norfolk Academy. The rising junior is a threat to block any shot originating from the lane and forces teams to adjust what they want to do offensively. He’s long and quick off his feet which helps him at both ends of the court. He doesn’t yet rebound out of his area due to a lack of strength but if the miss comes his way, it is usually his. Williams also showed a nice touch inside if not played physically and he can beat a lot of centers down court in transition. Levar Allen, a 6’1 guard in the 2019 Class, was the perfect leader for this young team. He surprises with his speed and quickness as well as his ability to score inside against bigger players. When it came crunch time, he was ready to make a play and came through far more often than not. Based out of the “DMV” (DC, Maryland, Virginia), Team Thrill plays in the Under Armor Association. One of the most enjoyable players to watch from a “basketball purist” standpoint was 6’10 center Chase Paar from Gleneig Country School. He’s got some old school and new school components to his game. The lefty has excellent footwork on the post and understands when to use his jump hook, spin move, or up-and-under move based on how the defense plays him. He knows where to pass the ball when the double-team comes and surveys the court as he backs his man down should he receive the ball of the block. Paar has sure hands, sets a mean ball-screen, and dominates his rebound area. The new school comes in as he can stretch the floor and make perimeter shots out to the arc. While Paar was dominating on the inside, 6’3 guard James Bishop was “making it rain” on the perimeter. The lefty has a quick release and deep range on his jump shot and despite the lack of back spin, knocks it down with frequency out to the NBA line. Though thinly built, Bishop is able to slither his way to points in the paint and makes tough shots. While more likely to pull up for a jumper than get all the way to the basket, he has the hops to embarrass bigs at the rim if left unchallenged. We also appreciated the play of Siegfried Reid out of St. Paul’s School. A 6’5 wing in the 2019 Class, Reid has the strength and physicality to play inside and the skills to produce points out on the perimeter. In a traditional system, he can play either the ”2” or “3” spot and use his strength to over-power opponents on drives to the basket or when pursuing offensive rebounds. Reid could also be the ideal “small ball four” with his ability to make shots from the outside but also switch out on the perimeter to defend as well as physically play against taller opponents in the paint.